Baby Colic, also known as infantile colic, is defined as episodes of crying for more than three hours a day, for more than three days a week, for three weeks in an otherwise healthy child. Often crying occurs in the evening. It typically does not result in long term problems.The crying can cause frustration for the parents, depression following delivery, excess visits to the doctor, and child abuse. Treatment is generally conservative, with little to no role for either medications or alternative therapies. Extra support for the parents may be useful.Tentative evidence supports certain probiotics for the baby and a low-allergen diet by the mother in those who are breastfed. Hydrolyzed formula may be useful in those who are bottlefed. Colic affects 10-40% of children. It is most common at six weeks of age and typically goes away by six months of age. It rarely lasts up to one year of age. It occurs at the same rate in boys and in girls. 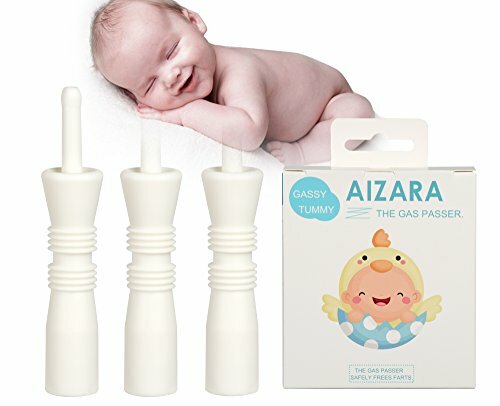 The Gas Reliever is a wonderful product of a natural solution for colic, constipation, and other gas-related problems. The Gas Reliever works instantly and does not require ingestion of any drops or medication. The Gas Reliever is a single-use catheter that helps babies get rid of excess gas. Designed to be safe and effective. The Gas Reliever cannot harm your baby if used as instructed. Pediatric professionals are familiar with the method of using a rectal thermometer or tube to relieve gas, colic, and constipation. The Gas Passer is designed specifically for this purpose. The soft, pliable, hollow tube features a rounded tip that is long enough to reach past the muscle that prevents the release of the gas, and also has a stopper to prevent an insertion too far. Each package contains 10 disposable gas reliever.